I planted a cutting garden for the first time last year, growing a variety of annual flowers from seeds. I enjoyed the convenience of having a supply of flowers to cut for bouquets without having to worry about how they looked overall in the garden. Once the seeds germinated, it required some attention to keep the weeds at bay. As the annual flowers grew, however, they took over and significantly reduced the chore of weeding. Because I enjoyed it so much last year, I decided to plant another one this year. 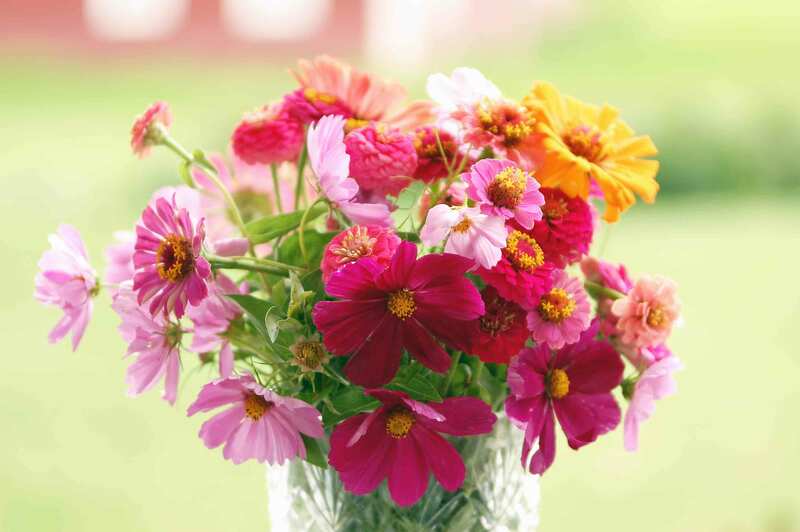 I planted cosmos, bachelor buttons, larkspur and a variety of zinnias. 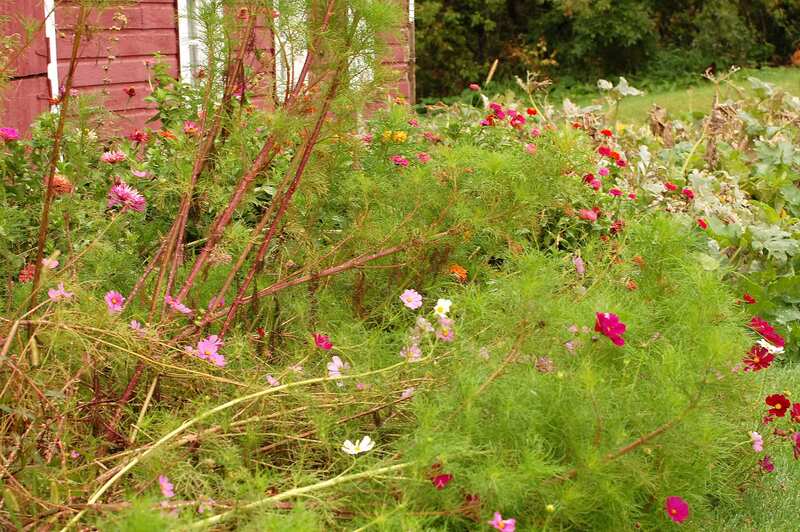 One mistake was planting the cosmos near the front of the cutting garden in one section because they grew so tall that they blocked out nearly everything behind them. Otherwise, the seedlings took off and started to flower. 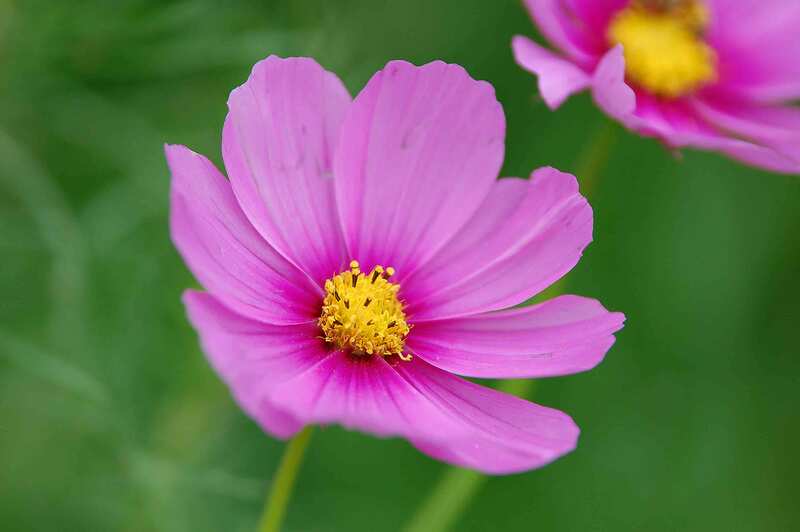 The cosmos are still blooming. Although the tall plants have collapsed due to the wind and heavy rains we have received. I know. It kind of ruins the lovely images of the cutting garden that you might have had, but it is the grim reality at this point in the summer. 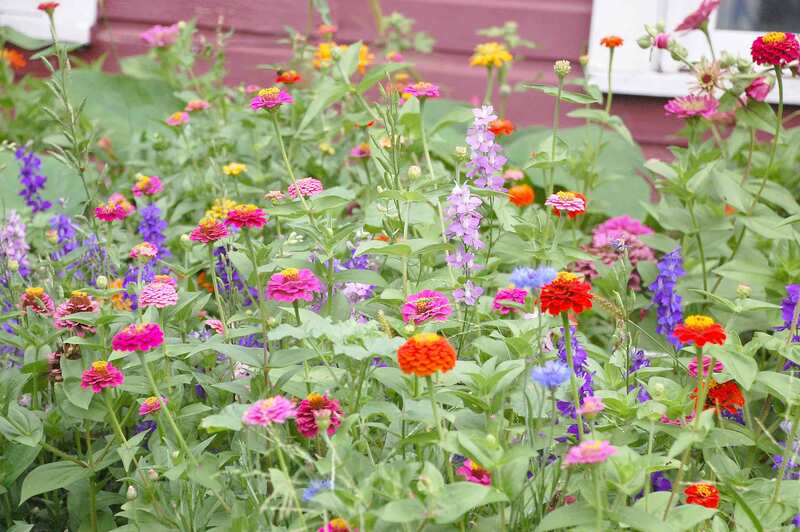 The zinnias are blooming in all shapes and sizes. Before last year, I refused to even consider growing these flowers because I had always stereotyped them as ugly “old-lady” flowers. You know, in the same group as marigolds. After browsing through the seed packets at the local nursery, I decided to give these old standbys a chance. 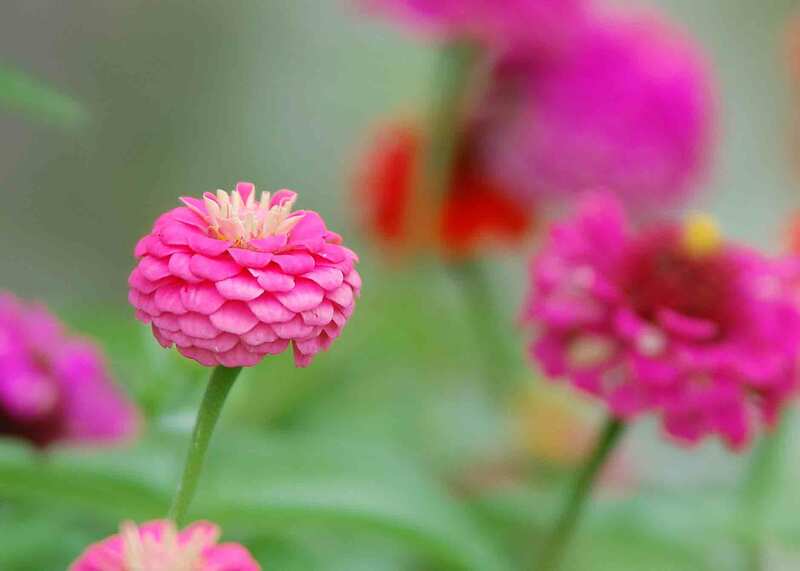 I am so glad that I came to my senses because these flowers are the stars of the cutting garden with their variety of shapes, sizes, colors and textures. I battled the new crop of mosquitos today after work and went out and picked a bouquet to brighten up the indoors. The flowers are getting a little tattered from all the weather, but I still managed to find enough to put something together. Having flowers from my garden in the house makes me smile and always cheers me up. It seems as though I typically only go out to pick a bouquet of flowers if we are expecting visitors. This is unfortunate because bringing the garden indoors is a great way to admire the fruits of your labor. I plan to have a cutting garden again next year and hopefully I will remind myself to take the time to treat myself to a bouquet of flowers inside more often. After all, that is the point of having a cutting garden! In these last few weeks before our first frost, my goal is to continuously have a bouquet on display in the house…just for me. That last bouquet has a “laid back” quality that I love. I once read that you should gather flowers in your garden everyday because then you do the work that needs to be done and your garden will look beautiful and last longer. Ruth, I think that is some great advice. I never do enough dead-heading. And why not enjoy the flowers indoors too?